As the Arab world joins Egyptians in celebrating the ousting of Hosni Mubarak, Ceasefire editor-in-chief Hicham Yezza says we should not forget how this victory was clinched from the jaws of mounting disappointment. The time now is for vigilance, to protect the gains so far and to ensure the Arab uprising continues, bigger and wider than ever before. “What happens when an irresistible force meets an immovable object?” many a theologian, philosopher and dilettante asked themselves down the millennia, with no answer. Well, Hosni Mubarak, that most unmovable of objects has now been moved, aside and across the horizon, by an irresistible force: the courage, determination and heavy sacrifice in blood and tears of millions of Egyptians. Whilst we savour this historic, almost unthinkable victory, we should nonetheless keep in mind a few simple truths. Lest we forget: this was a peaceful uprising but, thanks to the regime’s desperation to cling on at any cost, it was not always conducted in peaceful circumstances. Only the militant, steadfast resistance of brave young men and women broke the deadlock. At least 300 martyrs died and thousands got maimed and injured before any of this could happen. In the first few days, when the momentum repeatedly threatened to recede into a damp death, when the voices of doubt and scepticism (from the regime, the West, the media) got more strident, thousands of brave young men refused to let the fear back into their hearts and stood their ground in the face of brutal violence and thuggery. They refused to budge, when left to face on their own, in the anonymous darkness of several nights and days, the full force of state violence, and showed all of us that those who fight for principles will always win over those who fight for opportunistic, servile motives. In the end, the regime mostly gave up on blatant, systemic street violence but only after using it to the full, for days, and seeing it fail. Lest we forget: Mubarak was, from the start, a tyrant, a thief and a thug, and all his Western allies hurriedly dumping on him now always knew it. Everyone: Obama, Clinton (who called him a “family friend”), Blair (who called him a “force for good”), Biden (who said he was “no dictator”), Cameron, Sarkozy, Hague, Ashton etc etc etc. And yet, in the crucial days and hours when it most mattered, everyone stalled; everyone twiddled their thumbs whilst defenceless Egyptians called for help from Tahrir square and beyond, all of them kept hoping against hope that the Egyptian police, the Baltagia, Mubarak’s hordes of machete-wielding henchmen, would put a stop to this unplanned, unpredicted, unwelcome uprising. Day after day, hour after hour, the West’s leaders prevaricated and excelled in finding ways of speaking a lot without saying much. Eventually, with mounting pressure and body counts, they chose to be an obstacle to the democracy they keep lecturing others on, rather than a force for it. All in the name of “orderly transition” and “regional stability”, the stability of the graveyard, the stability of the torture chambers, the stability of docile unelected satraps putting the foreign policy interests of their patrons above those of their own people, the stability of the Omar Suleiman alternative (the very man directly responsible for decades of human rights abuses, who helped choke Gazans in their cage,) the stability of doing good business with larcenous tiny cliques at the expense of entire millions, crumpled on their knees with hunger, misery and despair: on their knees then, but not anymore, not ever again. Lest we forget: this is just the beginning. One dictator is gone but the apparatus of his dictatorship remains. His cronies and acolytes, his enablers and allies, are still hanging on, probably hoping they can find a way, in the revolutionary haze of euphoria and confusion, of recycling their Mafia system without anyone noticing or complaining. One Arab dictator is gone but more than a dozen others remain, afraid and paranoid and traumatised by the past few weeks, and preparing to do anything and everything to stave off the imminent, unavoidable, overdue wrath of their victimised, brutalised peoples. Lest we forget: none of this would have happened if it weren’t for brave reporting of media outlets (with Al Jazeera miles ahead of the pack) and citizens, which has offered, in the face of complete media and internet blackout by the State, a layer of protection to the protesters and a harsh unmasking of Western hypocrisy. When official propaganda kept repeating the protesters were few, were manipulated, were ordered by the Muslim Brotherhood, were run by the CIA or the Mossad, were vandals, were enemies of Egypt and agents of ‘Foreign Hands’, the live video feeds from Al Jazeera and others were a constant, incessant, unrelenting confirmation that these were nothing but increasingly desperate mendacities. Dictators, Arab or otherwise, are now on notice: they can leave of their own volition, or face the public indignity of being unceremoniously shoved off-stage by their own people, for billions around the world to see, live on TV. This revolution will not be stolen. 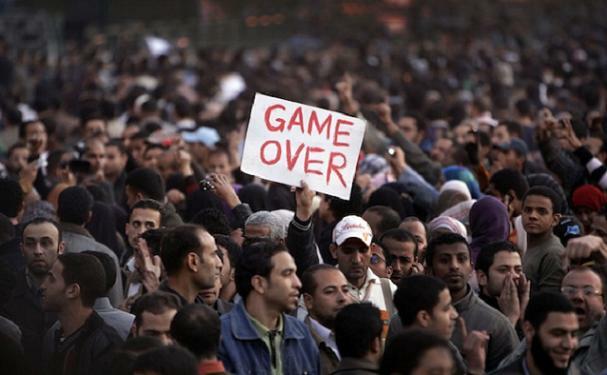 A century of shame and betrayals is coming to a close and an Arab spring is upon us. It’s early days, but certainly too late for the wheel of history to be turned back. It is time, for all Arabs, to tell their corrupt, incompetent, mediocre, unworthy usurpers that their time is up: fear has changed sides. Hicham Yezza is editor-in-chief of Ceasefire. Strange how the idea of revolution appears so seductive to many…while it means unrest, violence and …blood. Maybe because many, like you, live abroad…far…far from the battle field! Revolution is not expressing anger…it is not revolt. It is a strong idea that leads to a powerful act : the destruction of what it exists to replace it by something new. Revolution is serious. It cannot be spontaneous… twitted or facebooked. But what can I say. Bush is gone. It is Obama time! Wonderful article – thank you. Yes one hopes the time of the tyrants is over – but a note of caution if you will.. There is double standards in the reporting with many a globalist glee at nasty dictator shooting civilians. What of the thousands that are collateral deaths from drone attack in Pakistan and Afghanistan – all in the name of shooting a handful of no-named terrorists. One also hopes this revolution is not playing into others hands – globalists or extremists.